After a lovely homestay with some readers in Las Cruces (thanks Lisa for the checmical toe warmers! 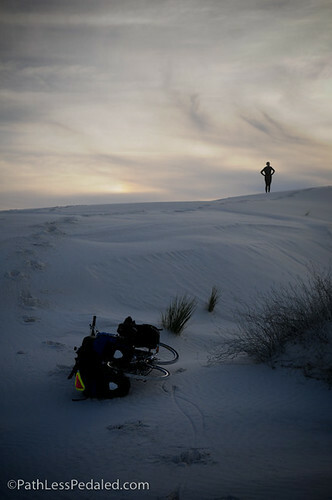 ), we hoofed it over Saint Augustine Pass and headed towards White Sands National Monument. 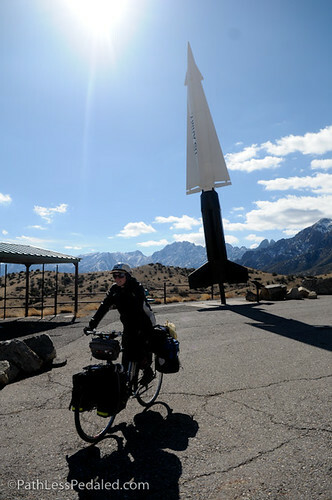 When we reached the top there was a large Nike Missile marking the summit and the start of a long, straight and fast downhill. We tucked in, took the lane and bolted down the highway going as fast as our nerves would allow. 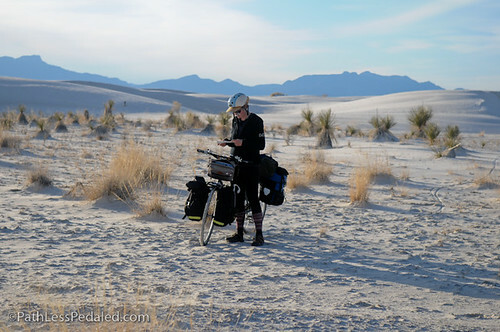 After the thrilling descent it was many flat miles to White Sands (63 total for the day!) into a variable headwind. 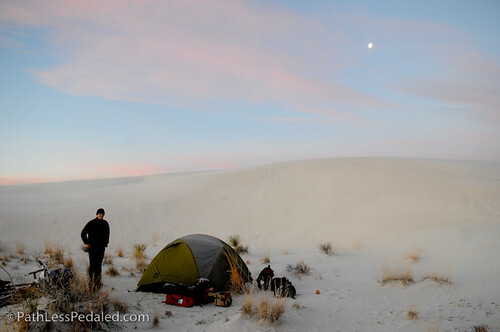 I had never heard of White Sands before until one of our Facebook fans mentioned it. 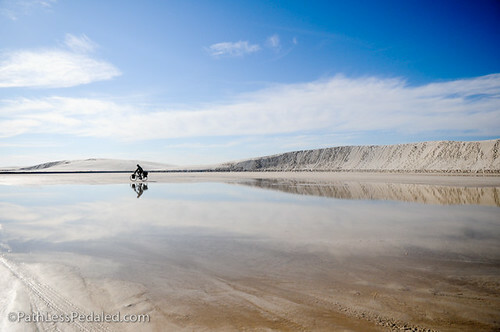 The sand there is a blinding white in the day light and is made of gypsum. Its texture is interesting more like packed snow than fine sea sand. The park encompasses several large constantly moving dunes of the sand and is in close proximity to an air force base and missile test site. Occasionally, I had read online, an errant missile would land in the national park area. Of course, we decided to camp there. We pushed on and made our way to the trailhead where we could find the “well marked trail” that would lead us to the camping. Well, we found a small brown post with an arrow that pointed toward somewhere in the general vicinity of all the sand. The trail was relatively hardpacked at first but then gave way to slushy sand that made pushing our 140lb loaded bikes a lot more work. We quickly figured out that the trail was routed over the tops of the dunes and probably wasn’t designed with a loaded bike tourist in mind. 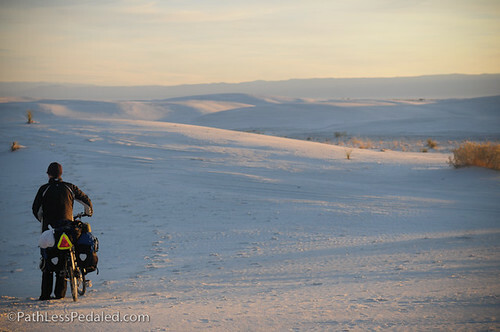 We tried for about half an hour to follow the trail, finding low spots in the dunes to trudge through but it became clear that we weren’t going to get close to any of the marked campsites before it got dark. We had a decision to make. Do we keep trying to push toward these campsites many dunes away or face the potential ire of a ranger who might discover us free camping (you sign a contract at the visitors center and the woman behind the counter was very insistent that someone would come around at night and check on us)? I reasoned that the rangers would probably think it a lesser inconvenience to stumble upon two campers in an undesignated site than to stumble upon two lost dead campers. It was a hurried affair because it was getting dark and it was getting cold. While the predicted temperature was 30 degrees it felt much much colder because the sand didn’t retain heat and just reflected the cold. It was like camping on concrete. When we were all set up we hopped in our sleeping bags and bided our time. At around 6pm, we heard a ranger over the dunes on a loudspeaker announcing that they were closing the gate at 6:30 and you had to vacate by then (standard operational procedure in the park). It was deathly quiet. No wind and the freezing layers of sand made a perfect sounding board. You could hear everything. Just about when we were going to fall asleep I saw light hit the tent. I thought it was a flashlight and that we were found out. I woke up Laura and slowly lined up my justifications to the ranger that I thought was outside the tent. I quickly fumbled with my sleeping bag zipper, the tent mesh zipper and finally the exterior tent zipper. I looked out and was horrified when I saw what looked like rocket trails racing up the sky. Then there was the sound of two more large explosions. I did a quick mental assessment. It was dark when we were setting up camp but there didn’t seem to be any shrapnel or unexploded material around us. The person at the visitor’s center told us there were no scheduled launches tonight (but what did she know, she also told us the trail was “well marked”). What was there for us to do if it was a missile launch? Scampering in the freezing night could not have been any better than laying in our sleeping bag. For a second, I felt that our fate was sealed and at the very least we had a good run of it. I wondered if I would have been happier if I had lived the last six months behind a desk under the protective glow of fluorescent lights rather than facing annihilation by conventional missile fire. I thought about what strange creatures we human beings are that we have to create such terrible terrible weapons. I felt empathy and a great sadness for every person who has been on the receiving end of these weapons. What do we do? What do we do? What do we do? I don’t know. This was much worse than an angry ranger. This was much worse than a dozen angry rangers. We sat there in the tent and watched the sky and listened for a long time. Nothing. About an hour later we heard talking and laughing. Suddenly, Laura remembered the woman behind the desk mentioning something about some students camping out. Maybe they brought some fireworks with them. Maybe they were launching model rockets for a class. We never found out for sure, but we were relieved nonetheless and decided to break camp at first light. After a while I fell asleep. I slept as well as any person could that has seen the fire in the sky and felt a moment from annihilation. Wow. I think these is my favorite post/photos/story of your entire adventure. Just wow. I know it was seriously scary when it was happening but I almost fell out of my chair laughing at your description of the event. No one can ever say your trip has been dull, between the shanty towns, brothels, and rocket fire, you’re living on the edge guys. I had a similar experience when camping near Port Townsend. I woke up in the middle of the night to the sound of a whooshing drone that sounded like a jet fighter taxiing or a missile taking off. Fellow campers were just as clueless as I was and we all thought we were going to die. There are a ton of Navy and Air Force bases near by so we just figured it was the end of the world for about 15 minutes there. Oh come on! What an awesome way to die! Imagine what you could say to all those folks who think cycling on the road is so dangerous? Oh my gosh, I laughed so hard!!!!! Great writing! Nice image! One of my favorite from the trip so far. Wow!! I think I was the one who recommended white sands to you two. Great story, great shots, great adventure… all in the name of LIVING! Like I was there with you. More! More! Great pictures! When I stayed there I had to unload my bike and hike at least a 1/2 mile in to find the campsite. That was in the middle of a sandstorm with 60 mph gusts that made sleeping kind of difficult. An amazing story and fabulous pictures. 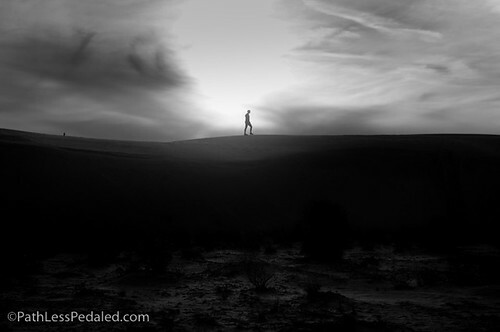 I visit my parents in Las Cruces, have been hiking in White Sands and you bring it all home. Keep adventuring! I spent 2 nights here in the summer of 2003 and found it to be one of the most interesting places I’d ever been to. It was the middle of the summer but the sand was cool and perfect for tent camping. Love White Sands. Good story line and great pics. Inspiring.